When Whistler Blackcomb launched their If Ullr Was a Girl campaign back in 2006, they got angry letters of complaint from people who found the whole suggestion that Ullr was responsible for snow, or was even vaguely god-like, to be offensively sacreligious. 1. The church just stopped meeting for lack of members, but the social cycling club, which meets weekly, boasts a membership numbering 10% of Whistler’s population. 2. 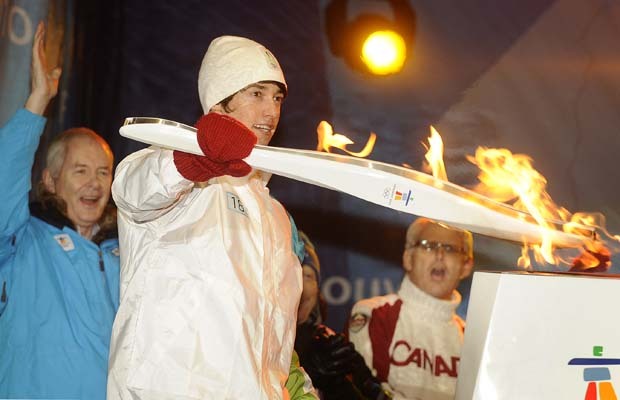 A 17 year old cross-country bike racer, Tyler Allison, lit the Olympic torch, and everyone was okay with that. 3. Flagellation is embraced with monastic intensity. To wit: Pemberton’s technical marathon crosscountry bike race, NimbyFifty is hailed as deliciously savage. 4. As with all world religions, death, decay and sacrifice are part of the metaphysical bundle. The regeneration of the sport is tied inextricably to destruction. Whistler is a bike graveyard, a wrecking zone where the limits of 2 wheels is constantly pushed. 5. Mecca status has been granted to the Whistler Mountain Bike Park. 100,000 pilgrims come every year to ride those 200km of lift-serviced trails. 6. Evangelists abound. Expert coaches and “gravity guides”, bike store owners, bloggers, trailbuilders and map-producers all share the sport they love, looking to convert the sceptical. It means we are living in the Promised Land. It might smack of paganism, but my heart is worshipful. My one caveat: don’t ride when there’s lightning out.